A beautiful 9 BED 9 BATH lakefront cabin, this is one of the nicest NorrisLake properties! This large 3 Story Lake Homes in the Lakeside Estates subdivision on Norris Lake is perfect for reunions, group vacations and business retreats. 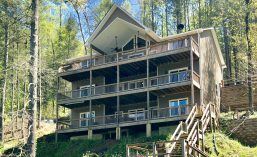 It sleeps 26+ featuring 9 BEDS and 9 BATHS (each bedroom has its own private bath), 3 full length 50 foot decks, with hot tub on lower deck, all with beautiful lake and mountain views. It has a large main upscale kitchen and dining room and there is also a kitchenette with bar on lower level. Laundry rooms on 2 levels. For your lake activities, it has a 2 Story Dock with slide, covered slip and dock furniture (in season). We are only 45 mins north of Knoxville and 1 1/2 hours north of Pigeon Forge and Gatlinburg resort areas. You can view photos if you click the “Photos of Southern Comfort” link. You can view the home’s amenities under “Southern Comfort Renter Information”. To inquire about renting, click “Contact Us” or click on the “Book your week here” link to the right.